Magnetic resonance is one of the most important experimental techniques of our time. It can provide detailed information on the structure of molecules, their internal motions, and their interactions with each other. As such, it is an invaluable tool for chemists, biochemists, and materials scientists. At the same time, it is widely used in clinical diagnostics in the form of magnetic resonance imaging (MRI). therefore sits at the crossroads of fundamental physics, chemistry, and the life sciences. Moreover, the instruments used for magnetic resonance (NMR and EPR spectrometers and MRI scanners) make use of cutting-edge technology. The MSc degree program in magnetic resonance is designed to give students a deep and broad education on all aspects of magnetic resonance, ranging from the foundations of spin physics, the operation and design of advanced magnetic resonance equipment, to advanced applications in chemistry, biology, and materials science. A diverse and carefully balanced curriculum makes the MSc in magnetic resonance a truly interdisciplinary degree. The aim is to provide students with a solid basis to pursue successful careers in research and development. Why Magnetic Resonance in Southampton? The University of Southampton has a long and proud history of making important contributions to the field of magnetic resonance. 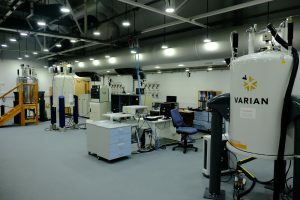 Magres@Soton, its magnetic resonance research group, consists of six active research groups, each led by an internationally renowned researcher, and each contributing at the cutting edge of a particular area of magnetic resonance research. 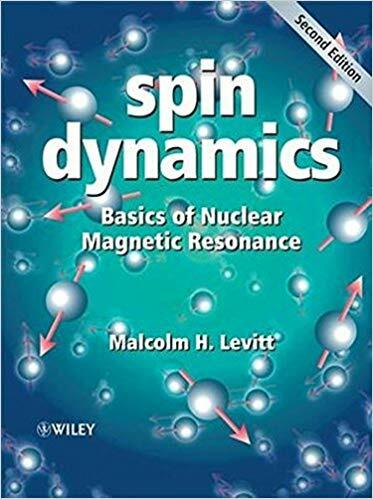 This includes the group of Prof. Malcolm Levitt FRS, who is widely known in the field for many seminal contributions to the theory and methodology of magnetic resonance. He is also the author of the popular textbook “Spin Dynamics”, and the simulation software toolbox “SpinDynamica”. MagRes@Soton are one of the leading research institutions in magnetic resonance in the UK. Our infrastructure is second to none, with (currently) nine operating spectrometers. 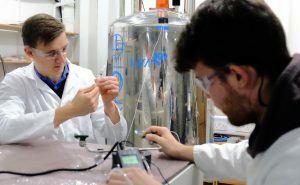 Many of our instruments have recently been upgraded through a £2M grant from EPSRC. In addition to commercial instrumentation, we also build many of our systems in-house. The necessary engineering know-how forms an important basis of our research success, and features prominently in the curriculum. As a student in our MSc programme, you will be trained to use these systems, and you will undertake an independent research project with full access to our infrastructure. If you currently hold or are about to obtain a BSc degree in chemistry, physics, biochemistry, or a related field, and are thinking of a career in research, this programme will definitely be of interest to you. The curriculum is designed to accommodate students from a broad range of backgrounds, and bring each of them to the interdisciplinary level required in order to make independent scientific contributions.